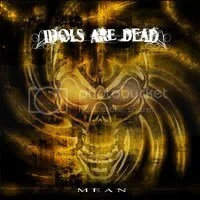 Last month, I had the pleasure of reviewing Idols Are Dead’s debut album Mean and I thought it was great. So, of course I jumped at the chance to have a little Q&A session with band members Mana & Ico! 1. 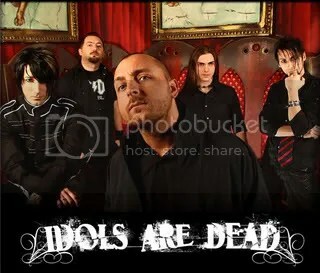 For those who don’t already know, tell us a bit about Idols Are Dead: where are you from, how did the band form, which band member is most likely to send naked girls running out of his hotel room and screaming into the night, etc. That kind of stuff. (Ico – guitar, vocals): Hi guys! What to say in addition? We started it all as a joke and 11 months after we were on the same stage with Iron Maiden, Slayer, Stone Sour, Mastodon… Then other 13 months and the gig was with Opeth, Gammaray and In Flames. I guess it’s time for Idols Are Dead to believe ALSO in miracles!! 2. With one album already behind you and plenty of shows under your belts, what are your plans for the rest of 2009? (Mana) I can easily agree with Ico he he… seriously, we’re starting to write new stuff but we sincerely want to continue in strongly believe in what “Mean” could do y’know. In other words we really wanna find a licence deal for the U.S., we got an ultra cool manager there and we hope we can reach this goal! It’d be very important to help us coming there in tour obviously… see what happens! 3. Your sound is a blend of old school thrash & heavy metal and modern metal that could go over quite well in America, so when can we expect Idols Are Dead to storm the shores of the United States? I hope we can come very soon in America and we’re already negotiating it with our manager Alex Gilbert. But I can’t add more details right now, just keep the finger crossed!!! (Ico) Wait&Bleed guys… we’re coming!! 4. Walk us through the creation process of your songs. Do they generally begin with a single note? A lyric? An idea for theme & mood? 5. If there is one song you had to pick from Mean to tell the world “this is what we are about”, which song would it be and why? 6. On Mean, you a do a great version of Guns N’ Roses’ “It’s So Easy”. Has anyone from GNR heard the cover? If so, what did they think of it? 7. Any fun “rock ‘n’ roll” stories to share from your careers? You may change names to protect the innocent! 8. What would your ‘dream tour’ look like? Which bands would you like to play with and which venues/countries would you play? (Mana) Nice question! Uhm… let me think. I would like to say a Tour like Taste of Chaos maybe… I really loved the line-up of last year! It was amazing: Avenged Sevenfold, Atreyu, and Bullet for my valentine all on the same stage! If you add Idols Are Dead it will become perfect J … talking seriously I wanna say I REALLY hope to come over and perform all around the States… here in Italy all people say we have one of the most intense show of the country so we’d love to take it overseas! Anyways, thank you very much for the chance of this ‘view… we have appreciated sooo much!!! IAD. Well, that’s it, folks! Short and sweet! I want to take the time to thanks Alex Gilbert for putting this together, and of course, a very special thanks to Mana and Ico for taking the time from their busy days to answer my silly questions! Oh, and if you haven’t gotten your hands on Mean yet, I definitely recommend you do. It’s a great metal album and well worth your time tracking down! YES! Now this is some modern metal I can really get into! I’ve been wanting to try out some heavier stuff than my usual 80s-inspired hard rock and this is just what the doctor ordered! Idols Are Dead are heavy, but not *too* heavy. They are a melodic blend of good old-fashioned heavy metal, thrash metal and modern metal, so they keep things interesting and don’t just pummel your ears. The songs are really catchy and have stuck in my head after listening to the album. And you know these guys’ hearts are in the right place because they do a cover of Guns ‘N Roses’ “It’s So Easy”… and it’s pretty good! But this album isn’t some 80s heavy metal throwback, the band has taken old thrash and metalcore and made it work. I’ve seen others reviews comparing their modern touch to Avenged Sevenfold or Trivium and that sounds about right. This Italian band is trying to break in the U.S. and I really hope they do because this is a really strong record that the States needs to hear. Definitely looking forward to hearing whatever they come up with next.